Weird and wonderful in equal measure, London’s CalatrilloZ serve up a delightful set of highly inventive progressive metal while looking like a bunch of vaudeville shock-jocks from Mevagissey. Seeing the wacky face paint and semi-steampunk image for the first time certainly throws a swerveball at what the band deliver musically, but isn’t it good when a band defies – or denies – your expectations and hits you with a sucker-punch? With CalatrilloZ what you see certainly ain’t what you get, and whereas they might look like an outfit sculpted from the most surreal alcoves of Tim Burton’s imagination (and no doubt the theatricality comes into its own on stage), aurally what you get is a highly creative band with a liking for time-changes, hard riffing and very, very exciting songs. Masking their identity not only with the Max Factor but with stage pseudonyms too, vocalist Zahyin, guitarists Vargovar and Azriel, bassist Mobius and (in comparison) the very ordinarily-named Jimmy Sticks have put together a diverse showcase of what twenty-first century metal has to offer, technically proficient yet eminently accessible, and all topped off by Zahyin’s vocal pyrotechnics. There’s much to praise and little to fault in an album which brings to mind the originality of the likes of White Zombie and Hell. There’s the grandiosity of ‘Lords Of Misery’ which, once the theatrics have run their course, takes off and really soars, buoyed rather than over-burdened by its Queen-esque harmonies; the more to-the-point album opener ‘Origins’ kicks things off with a fabulous opening riff; ‘The Long Winding Road’ is just that, using time changes to emphasise the meandering characterisation of its title; and personal favourite ‘I’m Alive’ is an anthemic neck-breaker with a fabulous chorus and an unexpected change of direction, and is a song which pretty much showcases all the band’s strengths in one five-minute workout. 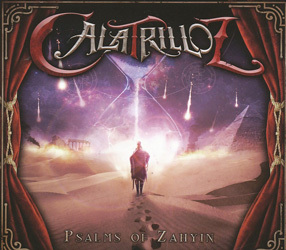 At just six tracks and 31 minutes long ‘Psalms Of Zahyin’ is a relatively short offering, although that makes it nice and easy to appreciate the whole thing in one sitting; it’s not a concept piece, but it does works much better if you listen to the whole shebang from start to finish rather than just dipping into a track or two at a time. Trust me on this.